If you’re using Infix to create and edit PDFs, you’ll be well aware of the versatility of the PDF format. As you build a complex document full of images, graphics and different fonts, you’ll notice that your files become quite large. Once your PDF is finished, you may find that it’s too big to attach to an email, and the file size may also make distribution over the web impractical. But the beauty of the PDF format is the ability to reduce the file size. Since later revisions of version 5, Infix has included a number of compression tools that will make finished PDFs easier to distribute. These will also be included in the forthcoming version 6 release. Some users shy away from compression, fearing that it will adversely affect the quality of the images and text in the document. In some respects, this is a valid concern. Compression is always risky, and it’s down to the producer of the PDF file to work out how far they want to push the compression. In truth, the loss of quality is minimal in comparison to the advantages of having a considerably smaller file to work with. Additionally, the new image compression features in Infix are some of the most advantageous and desirable, since they do away with information that your readers won’t miss. There are two main types of PDF compression: lossless and lossy. Lossy compression will give you a smaller file size at the expense of some clarity; you might notice noise or fuzz around the edge of a diagram, for example. Lossless compression is less harsh, so the files produced tend to be larger but retain more clarity. Re-sampling is a common compression technique. To resample a PDF file, Infix looks at the pixels within the file, cluster by cluster. By averaging the values of each cluster, Infix can turn several pixels into just one, making the file size smaller. Resampling is particularly useful when the recipient wants to use the contents of a file at a lower resolution; it’s possible to re-sample images from print resolution to web resolution, for example, thus reducing the size of the file considerably. Automated cropping is used to cut down on file size by simply discarding parts of images that are not displayed in the final PDF. The visible parts of the image are retained. 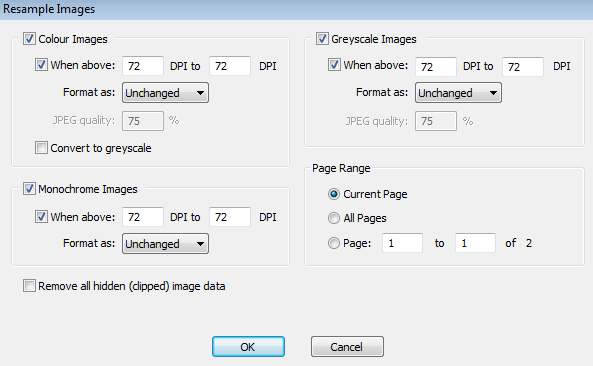 Greyscale conversion involves discarding colour information in order to slash the size of the PDF. If you’ve edited or created a PDF document in colour but intend to distribute that document in black and white, greyscale conversion will allow you to cut back on the file size while retaining sharpness in the images. This is handy if your recipient has a monotone printer, for example. Compression is all about finding a balance between size and quality, and what works well with one document may not work particularly well with another. Where size is more important than presentation, doing away with colour information is the best tactic. If your files are still on the large side, using fewer fonts may also help. And if you experience problems with fuzzy graphics after compression, try inserting PNGs and GIFs, rather than JPGs.